Professional LED Fiberoptic Otoscope. Never Worry About a Burned Out Bulb! Proprietary Full Spectrum Bright White True View LED Light similar to Sunshine. One Year Warranty on LED Light source!. Always seek Physician consultation for any medical illness or problem. Professional LED Fiberoptic Otoscope - Best Buy THE WORLDS FIRST AND ONLY LED PROFESSIONAL FIBEROPTIC OTOSCOPE! The energy efficiency and durability of this otoscope is simply amazing. The LED light source has no filament to break like a conventional incandescent powered otoscope. The LED bulb is virtually indestructible. You will be amazed by the amount of light created by the LED bulb. The light produced by this otoscope is full spectrum white light and not the yellow light typically created by incandescent light bulbs on other otoscopes. With a light emitting diode there is no fragile filament to break so it can withstand repeated dropping or rough handling. 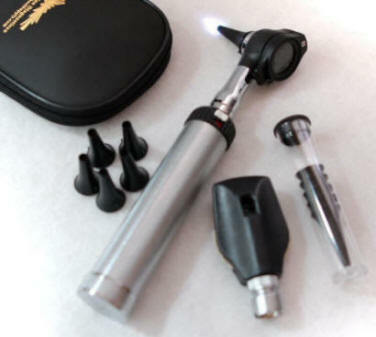 The halogen bulbs found on other otoscopes burn very hot and eat battery power, they are also somewhat fragile, and can be broken when the otoscope is dropped or handled in any rough manner. The special halogen bulbs in some premier otoscopes cost thirty dollars each, and aside from failing when dropped, they burn out after a time, just from ordinary usage. Of forty-two doctors surveyed, each of whom has used our LED Fiberoptic Otoscope over a period of at least three months, all but two have learned to prefer it, even to their wall mount models. It should also be noted that our LED otoscope uses a fiftieth of the power of a halogen otoscope meaning an ordinary set of C cell alkaline batteries will last for many months. Our otoscope can also make use of C cell rechargeables if you prefer. (please be careful to look at the total voltage of the rechargeable battery you purchase) . Buy two sets and you will never be without power to your otoscope. Some more expensive brands use a specialized rechargeable battery located in the handle. 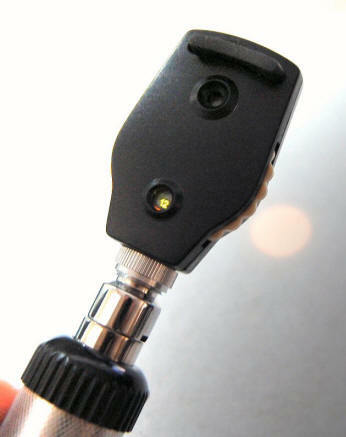 The entire handle must be removed from the otoscope head and placed in a special charging unit to to re-charge. Using ordinary, inexpensive size "C" batteries insures your otoscope is ready for action with a simple change of battery. Light is evenly distributed in the ear canal from the round fiberoptic pathway. Our Otoscope has been re-designed for better balance. We extended the neck so the otoscope is perfectly balanced at the point it would be held in your hand while doing a traditional otoscope exam. You need never contend with the expense of a burned-out bulb again, when you use our Pro LED Fiberoptic Otoscope! This is a photo of an otoscope with a halogen bulb for its light source. 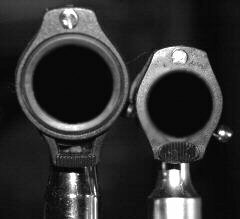 Note the halogen bulb is located in the head of the otoscope.....in the middle of your viewing lens. Our PRO LED otoscope has it's light source located in the neck, leaving your viewing window free and clear to view the ear canal. Our viewing lens is larger and has no bulb to disrupt your view. Prepare to be amazed at the clear, bright, unobstructed view it provides, using an LED light source, and a fiberoptic bundle to distribute the light. Nothing else is comparable, even among the most expensive of the "premier model" otoscopes. Our PRO LED Professional Otoscope is the finest available, without regard to price! One Year Warranty.on Light source of the Otoscope. The professional model ophthalmoscope is of excellent quality and gives a very clear picture of the retina. It contains a complete set of lens from -25 to +40 diopters. The lens also contain a polarized filter which reduces corneal reflection. Our Ophthalmoscope uses a halogen light for true tissue color and consistent, long-lasting illumination. You will be impressed with the functionality of this very well designed and manufactured ophthalmoscope. 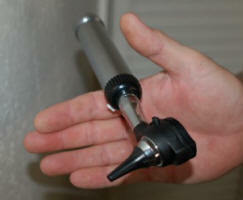 Our Pro LED Otoscope carries a lifetime guarentee against defects in workmanship. Should the unit fail to function under conditions of normal use, simply return the unit and it will be repaired or replaced free of charge. The warranty does exclude units that exhibit signs of use or abuse beyond normal and sensible wear and tear. No risk trial of your PRO LED Fiberoptic Otoscope......We are so sure you will love having your own PRO LEd Fiberoptic Otoscope we offer a 30 day money back guarantee. If you are not happy with your otoscope just return it anytime within 30 days for a complete satisfaction guaranteed refund of your original purchase price. I was initially worried that such a well priced product wouldn't be up to the job, but I needn't have been. The otoscope handle is sleek, beautiful to hold and a great weight. The heads interchange smoothly and the products feels solid. The light is so bright and makes examination super clear. I have been using mine for 2 weeks now and love it! I plan to order the dermatoscope head too. We have been purchasing Otoscopes and Dermatoscopes for the last 3 years and have been very happy with the speed of service and the quality of the instruments. Click the button below to add the Pro LED Fiberoptic Otoscope/Opthalmoscope Diagnostic Kit to your wish list.